The pathogenicity of previously published disease-associated genes and variants is sometimes questionable. Large-scale, population-based sequencing studies have uncovered numerous false assignments of pathogenicity. Misinterpretation of sequence variants may have serious implications for the patients and families involved, as genetic test results are increasingly being used in medical decision making. In this study, we assessed the role of the calreticulin-3 gene (CALR3) in cardiomyopathy. CALR3 has been included in several cardiomyopathy gene panels worldwide. Its inclusion is based on a single publication describing two missense variants in patients with hypertrophic cardiomyopathy. In our national cardiomyopathy cohort (n = 6154), we identified 17 unique, rare heterozygous CALR3 variants in 48 probands. Overall, our patient cohort contained a significantly higher number of rare CALR3 variants compared to the ExAC population (p = 0.0036). However, after removing a potential Dutch founder variant, no statistically significant difference was found (p = 0.89). In nine probands, the CALR3 variant was accompanied by a disease-causing variant in another, well-known cardiomyopathy gene. In three families, the CALR3 variant did not segregate with the disease. Furthermore, we could not demonstrate calreticulin-3 protein expression in myocardial tissues at various ages. 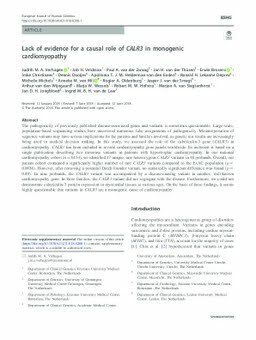 On the basis of these findings, it seems highly questionable that variants in CALR3 are a monogenic cause of cardiomyopathy.